Amber Gauthier is the PrintingCenterUSA’s marketing and graphic design guru. Amber knows the importance that print marketing can make to a business and enjoys sharing her insight on everything from design tips to layout advice. She received her bachelor’s degree in Business Administration from the University of Montana. She also holds a certificate in Digital Marketing. When she’s not at work, you can most likely find her binge-watching TV shows and playing with her adorable dog, Luna. When it comes to printing, most people turn to what is familiar – their local Kinkos®, now called FedEx Office®. And when they search online, they are trying to find out some specific information on how much their printing needs will cost. But have you ever wondered why Kinkos® printing costs are SO expensive if you want more than one copy of that flyer your boss needs? This article helps you understand why they are so pricey and how you can save money on your printing needs! What are Kinkos® Printing Costs? Before we jump into pricing, have you decided which product you need printed? Some of our top products are Brochures and Flyers so for arguments sake, we want to show you our Brochure and Flyer prices vs FedEx Office®, so you can really understand their pricing. After visiting the Kinkos® Brochure Printing page, you will see that their print specification options are very minimal. 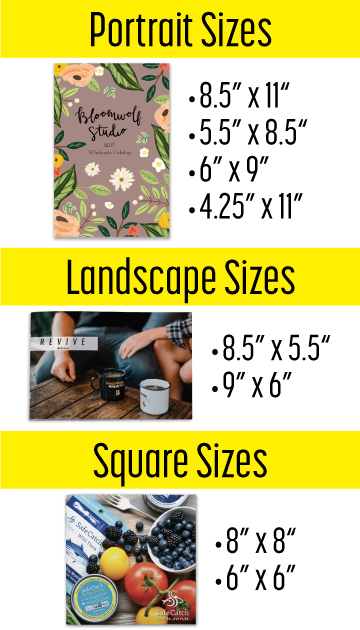 They only offer one size (8.5” x 11”) whereas other online printers, such as PrintingCenterUSA, have a number of available sizes ranging from 3.5” x 8.5” to 11” x 25.5”. After uploading your artwork and choosing the specs, you’ll see that the prices are ridiculous and border into crazy. (Don’t believe us? See the image on the right for a brochure printing price comparison). 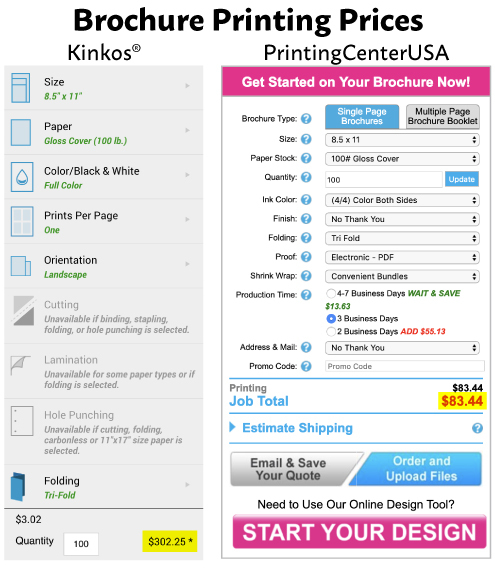 As you can see, even with the same specs selected, Kinkos® printing costs for 100 brochures is over 3 times higher than printing prices at PrintingCenterUSA! 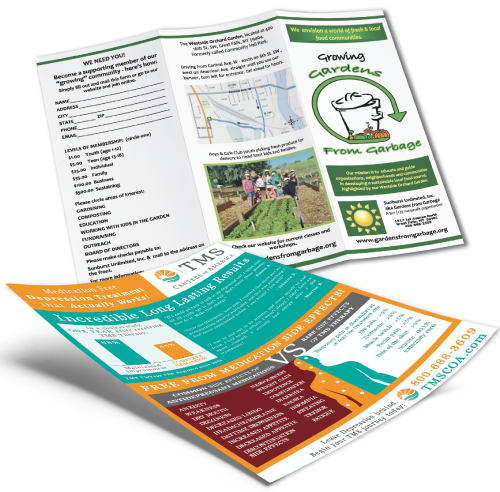 Now say you’re on the market for some new flyers – again, online printers beat out Kinkos® Flyer Printing prices by a landslide. As shown in the image on the right, after uploading your artwork and choosing the product specifications, FedEx Kinkos® is not an affordable flyer printer choice. Even with the same product specifications selected at both printers, Kinkos® flyer printing costs are far higher than those of an online printing company. 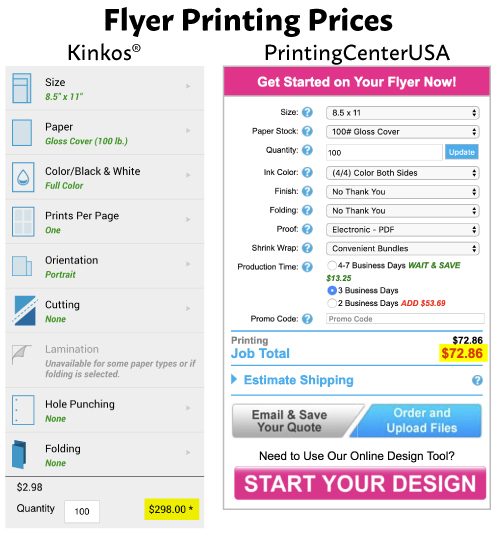 At PrintingCenterUSA, you can get 1,900 flyers for the same price as 100 flyers from Kinkos® (WOW!). Why are Kinkos® Prices So Expensive? The reason FedEx Office® is so expensive is because instead of existing as a trusted online printing company with a single location like us, they have about 2,000 locations nationwide. So basically, you pay extra to keep all those stores in business. You pay to stock those stores, you pay the staff, and you pay for all the equipment to keep each and every store running. Why not choose the #1 Rated Printing Company for your printing needs? Our single location means we have access to getting you the lowest price because we don’t overcharge you for operating costs. We have hundreds of great reviews from our loyal customers, and we want to give you a great experience too! Don’t Overpay, Order with Us Today! Let us prove to you why our slogan is Fast, Easy and Affordable. Contact us today via email or call us at for a custom quote. If you aren’t quite sure what you need, order a free sample packet of all our products so you can view all our high quality products. We also have online design tools and FREE templates to help you get started! *Note: Our prices DO fluctuate throughout the year. This pricing is accurate for the time this article was posted. Many people don’t know where to start when it comes to catalog design. This daunting task is made simple when you follow these helpful tips. Don't get overwhelmed with all of the pages and information you want to include; instead start by outlining the goal of the catalog. Figure out what you need to accomplish there are different types such as a sales catalog, and informative piece, educational, a guide or a display catalog. Next, put yourself in the shoes of your audience. What would attract them, what information do they need, and what will keep them turning the pages. After gathering this information then start designing. Do you have the look you want? 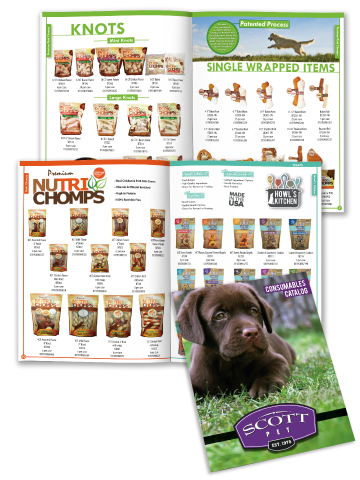 Don’t forget the design and of your catalog is just as important as the information. It doesn’t matter how great your information is, if you have poor images and poor print quality, your audience may be disinterested and less likely to read. 1. Use engaging colors, images, and design elements that represent you or your company. 2. Stick to a simple font that is easy to read. Consider size, style, and color. 3. Use white space, and use your space wisely. Keep a good balance, don’t use too much or too little text or images. 4. Eliminate unnecessary elements or distractions. 6. Full color images with 300dpi or more resolution are perfect for catalogs. 7. Keep a consistent style and look throughout the entire document. *Depending on the type of , you will need a reference to your website, an order form, table of contents, glossary, and an index. PrintingCenterUSA can easily help you order a Catalog and have it shipped to your doorstep fast! We give you fast and free quotes, and have a knowledgeable staff and helpful customer service representatives who can help you get started. 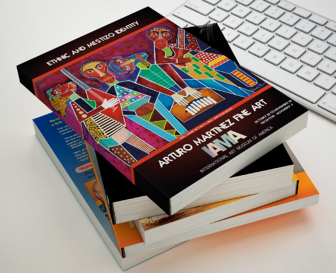 If you already have design software and just need help getting started, we also offer to help you start designing a beautiful catalog that people will always remember. We also have a where you can drag and drop your images and make a stunning catalog without needing any of your own design software! Now that you've seen the best way to showcase your products, ! 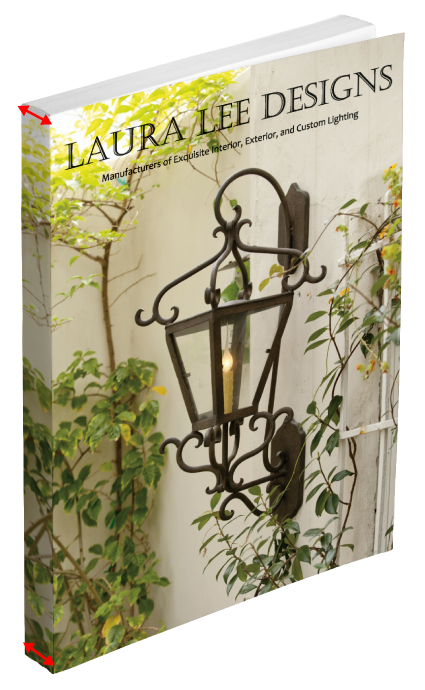 Not sure if a catalog is right for your needs? Click here to see all of our printing options. Perfect binding is a popular type of book binding you see on soft cover books such as paperback books and magazines. The internal pages are printed on both sides of text weight paper, then gathered together (collated) into a book, one on top of the other, in numbered page order. The cardstock cover of the perfect bound book is placed over and around the inside pages, attached along the binding edge by the application of a strong yet flexible PUR glue. Is Perfect Binding Right for Your Project? Perfect Bound Booklets aren’t limited to authors who are printing books of 500+ pages. The minimum page requirement is 28 pages and plenty of businesses and organizations use this method on a variety of printing projects because of its highly professional appearance and relatively low cost, in both short runs and larger order quantities. Perfect bound binding is commonly used for a variety of publications, such as manuals, reports, catalogs, magazines, photo books and more. We know that perfect bound books are a no-brainer when it comes to high page counts. With any booklet that contains more than 92 pages, perfect binding is definitely superior and highly recommended and is affordable. The primary benefits of perfect binding books are that they look professional and offer great visual appeal. Also, there is the option of placing content on the spine, such as an author, book title or any type of design. This is something that neither or binding offer. Perfect binding definitely produces a high quality and professional look that can’t be matched. Understanding the difference between the term “sheet” and “page” is key to correctly assessing your booklet’s final page count, which can in turn affect your quote, production time and more. For perfect bound booklet printing, you must have at least 28 pages, and up to 2” thick. First, let’s start with a single sheet of paper. It has 2 sides – a front side and a back side. With perfect binding, one sheet of paper equals two pages (unlike ). If you are holding up a sheet of paper in front of you, you are looking at page 1. Flip the page over and you are now looking at page 2. For example, pick up a book and as you turn its pages, notice that each “page” has two sides (the front and back of one sheet of paper). Your printer will refer to each side as its own page. So each sheet within your book will be counted as two pages. Now that you understand the difference between sheets and pages, you can easily give your print shop the correct page count when submitting your . As shown below, if you take a closed book so that you are looking at its cover – that’s page 1. Open the cover and you will be looking at page 2 (left) and page 3 (right). Keep going until you close the book and are looking at the back cover. The back cover will count as your last page. All-in-all, make sure to count every page, including the cover, the back cover and the inside pages (counting any blank pages) for your total page count. Unlike a whose open pages lay flat, perfect bound books are glued at the spine and cannot lay completely open without breaking. During the binding process, an area of each page will disappear into the spine, also known as the gutter. Depending on how many pages are in the booklet, the gutter can take up between 1/4” – 3/8” of each page. It’s good practice to leave at least a quarter inch of safety margin space on the insides of each page. Be careful to keep note of which pages will be on the left or right side of your perfect bound book so you can place your safety margins on the correct side. Keep all text and any images that need to remain visible inside the safety margin so they don't get lost in the gutter. If you decide that you want one image to be featured across two pages, keep in mind that the alignment of the photo where the pages meet together might not perfectly match up. When an image covers two pages, the gutter area will still obscure at least a quarter inch off of each side. It might seem like a small amount of space to worry about, but it can drastically affect the photo’s appearance. It helps to choose photos that won't be so obvious that there's a gap missing (for example, a person's face across 2 pages might be a lot more noticeable than a photo with less detail). A unique feature of is the ability to design the spine. You can keep it a solid color, add text or have one continuous image covering the front cover across to the back cover. Setting up your cover correctly is very important for perfect binding because the width of the spine needs to match exactly with the thickness of your book (which depends on the paper weight and number of pages you choose). As soon as you have a final page count, give us a call at and we can help you choose your paper weight and calculate the width of your book's spine. PrintingCenterUSA is happy to answer any questions you have about perfect book binding or any of our full color digital printing services. Call us at or send us an e-mail. Saddle stitch is when single sheets of paper are printed on both sides, collated in page number order, folded in half and then stapled through the fold by a saddle stitch stapler. Saddle stitch binding is one of the most common binding methods for booklet manufacturing. Saddle stitch binding is an ideal and economical choice for booklets with smaller page counts. We also recommend saddle stitch for publications with less than 92 pages. For page counts over 92 pages, we recommend perfect bound booklet printing. 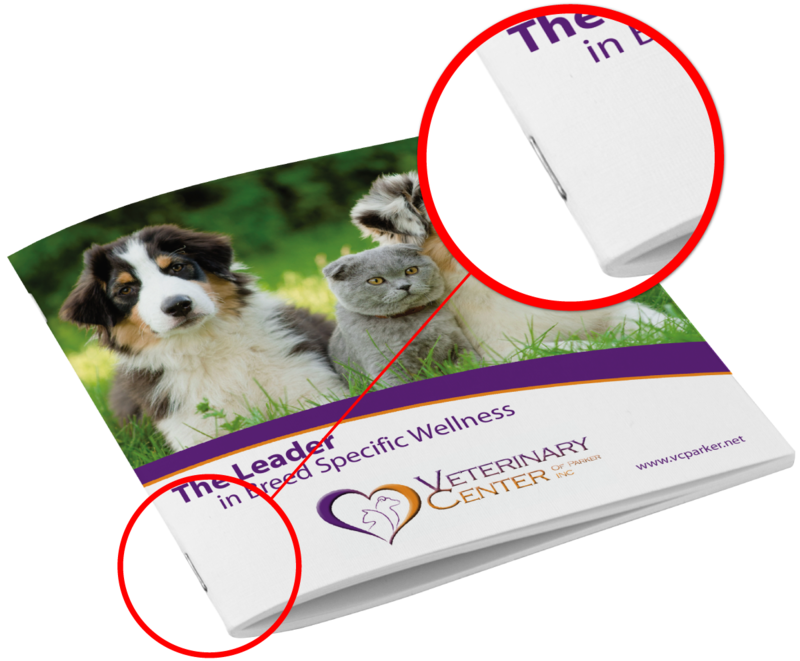 Saddle stitch booklets are great because they will lay flat and stay open when you are flipping through the pages, making it easier to read. Saddle stitch is our most popular binding type and offers the quickest turnaround time with the most affordable and cost-effective pricing. How Many Pages Do You Need for Saddle Stitch? 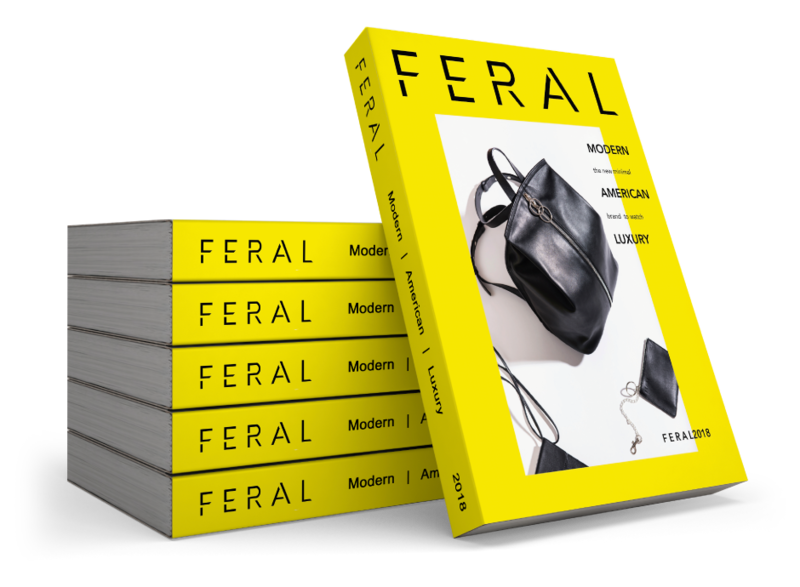 Saddle stitch binding requires that any publication has a minimum of eight pages, four pages per spread and up to 92 total pages. Saddle stitch documents need to be built in page multiples of 4 pages (8, 12, 16, etc.) because they are printed on sheets that are folded in half. See below for a more in-depth explanation on how sheets become pages. 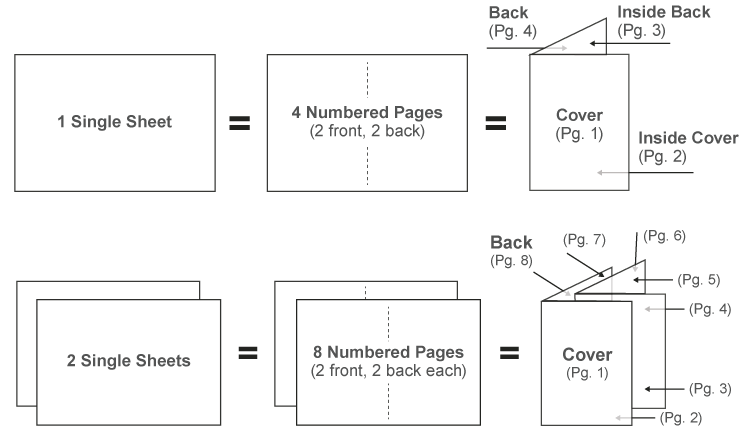 How you number your pages depends on the final page count. For example, in an 8-page booklet, the front cover is considered page 1 and the back of that page will be page 2 (inside front cover). The inside pages will continue in order like the diagram below as 3, 4, 5, 6 and so on. The last 2 pages will be your inside back cover (page 7) and the back cover (page 8). You can get pricing on your saddle stitch booklet by visiting our website. As mentioned above, the saddle stitch method requires that a booklet be printed out on large sheets of paper and then folded in half. Each sheet of paper will contain 4 of the booklet’s pages. 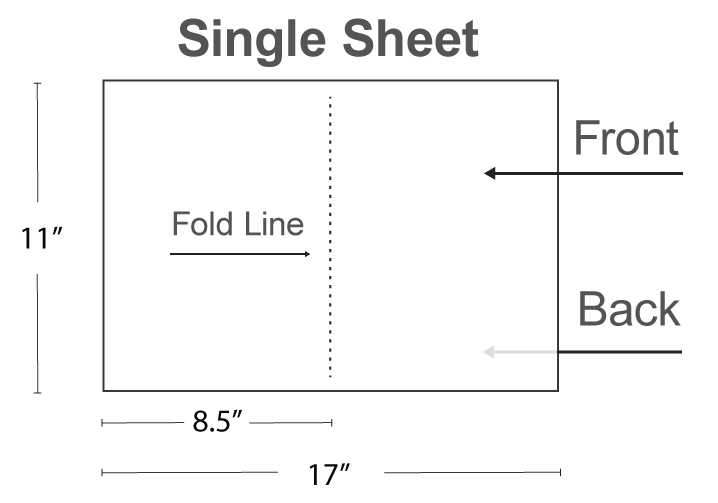 If you are printing an 8.5” x 11” saddle stitch book, its' pages and cover would be made from 17” x 11” sheets that are folded in half to the size of 8.5” x 11”. First, let’s start with a single sheet of paper. It has 2 sides – a front side and a back side. Once the sheet gets folded in half, it will have 4 sides (or 4 pages). The number of sheets will depend on the final page count of the booklet. Usually, any page count of 48 or less is considered a booklet and any job over 48 pages (with a maximum size of 92) would be considered a book. If your publication is larger than 92 pages, consider our other affordable binding options! Our most popular binding type for larger page counts is perfect binding (28 pages – 2” thick). During this holiday season, PrintingCenterUSA is looking to make a difference by starting a donation campaign to help the Special Olympics of Montana (SOMT) right in time for the nonprofit's annual Polar Plunge event, scheduled for December 7th in Great Falls, MT. We have 6 of our most daring employees "taking the plunge" and along with that, they are helping out a wonderful cause. 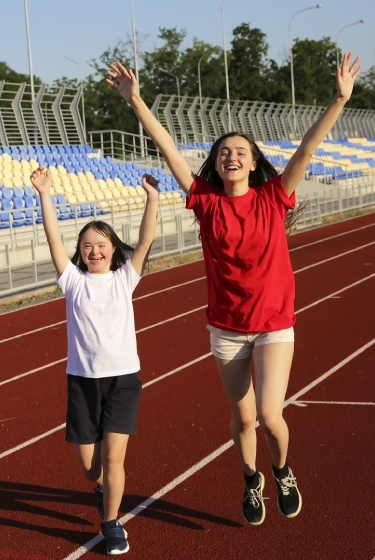 We feel honored to be able to help the Special Olympics of Montana execute its mission of empowering those with intellectual disabilities through the power of sports. By partnering with the Great Falls Polar Plunge, we are changing the lives of thousands of Special Olympics Montana athletes. With the money raised, athletes in the Great Falls area and around the state will have the opportunity to share their gifts and talents with the world through their participation in sports. Now you don't have to "take the plunge" to help out this great cause and it's easy to participate. By using the promo codes below when ordering online, we will donate up to $100 per order to Special Olympics Montana. Not planning on placing an order by December 6th but interested in donating to SOMT? No problem! Click here to donate to our Polar Plunge team! The Great Falls Polar Plunge is one of twelve Polar Plunges across Montana. Participation provides individuals and organizations with a unique opportunity to support SOMT athletes by taking an icy dip into freezing waters. Plungers must raise the minimum amount to earn the privilege of taking the plunge. They can also raise additional funds and earn extra incentives along the way. Events like the Polar Plunges help support over 3,000 SOMT athletes. Subscribe to receive updates on new Blog Posts, Special Deals, and Discounts.